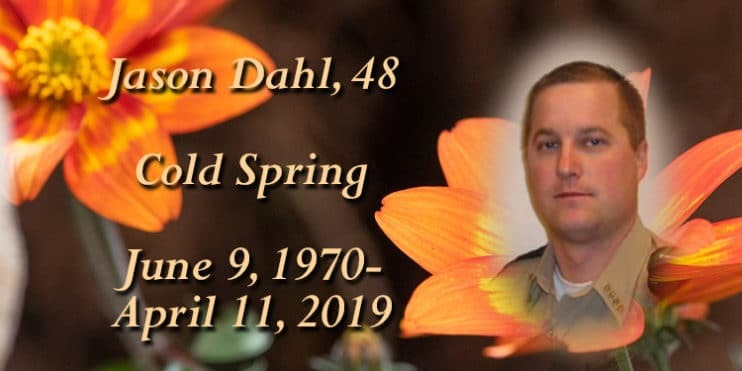 A Celebration of Life will be held from 4:30-9 p.m. Thursday, April 18 with a memorial service from 6:30-7:30 p.m. at The Olde Coliseum, 691 Main St. W., Richmond, Minnesota 56368 for Jason James Dahl, 48, of Cold Spring, Minnesota, who died peacefully, at home, surrounded by family on April 11. Dahl was diagnosed with non-Hodgkin’s lymphoma on July 20, 2018, which he battled fiercely during his cancer journey. In lieu of flowers, memorials and plants are preferred. Survivors include his children: Ali, Joe, and Bennett Anderson, St. Cloud; Payton and Nick Swanson, Mankato; his siblings: Karen Dahl family, St. James; James and Margaret Dahl family, Delano; John and Kim Dahl family, Spicer; Jeff and Jackie Dahl family, Lake Henry; JoAnn and Dennis Spaulding family, Paynesville; Jerome Dahl and Amy Hanson-Beseman family, Sauk Rapids; and Jack and Peggy Dahl family, Paynesville; godchildren Jonathon Dahl, Delano; Elizabeth Dahl, Paynesville; and Sierra Roeser, Paynesville; godparents James and Irene Jaeger, Lake Henry; dear friends Patricia and Randy Seykora, Cold Spring; Jon and Sherry Norstedt, Spicer; Vic and JoAnn Topp family, Paynesville, the Wednesday Night Wing Crew; and co-workers from the Stearns County Sherriff’s Department. Care is entrusted to the Wenner Funeral Home, Cold Spring. Read the obituary in its entirety in the April 19 editions of the Newsleaders or online on April 19.